Caustic Thoughts: Cybercrime Prevention Act of 2012 - Batas Horibilis? Cybercrime Prevention Act of 2012 - Batas Horibilis? The Cybercrime Prevention Act of 2012 is upon us. I guess I can only make fun of myself now, but there is a limit to the number jokes I can make about my cellulite. I, who thrive on sarcasm, have become severely handicapped now that I do not have the option to throw jibes at seemingly lobotomized politicians. You can be sued for libel even if you merely imply that an individual, dead or alive, has a real or imaginary defect. This part is so broad you might as well be sued for saying bad things about the man on the moon. The Act references a libel law so old, it's original authors have already decomposed. Eighty years ago, they could not have imagined that toilets in the future would have auto flush much less conceived the free-wheeling nature of the internet. The mere act of joking about a person can get you in hot water even if there is no malicious intent. I bet the next bill our senators will file will propose striking out the word "joke" from the dictionary. Law enforcers can seize computer data even without a court order at the mere suspicion of your having violated the law. Think action movies where cops burst upon unsuspecting culprits. Why don't you plaster your face on one of those characters to see what you'd look like in a similar situation so you can plan the perfect hair and makeup before a televised raid. You can go to prison for a maximum of 12 years and pay a fine of up to 1 million pesos. Good luck. Philippine prisons are meant to give people a preview of what hell is like. Millions of Filipinos will be found guilty of libel. Prisons will be so congested it'll be standing room only. A friend of mine, JL, says this might be the government's secret strategy for population control. He may have a point. After all, when one inmate farts in a cell of hundreds, quite a handful will pass out. I see the beginning of modern gas chambers. To evade capture, Filipinos will invent a new language for Facebook use only to add to the hundreds of dialects our people already have. It'll be based loosely on beki speak and jeje speak and will be indecipherable unless law enforecers are former bekis and jejemons. Virtual invisible ink will be invented. Either that or social media users will just have to learn to communicate meaningfully with ***** and %#@!/*. The only images that'll be shared on Facebook moving forward will be pictures of babies, pets, food and grandmothers knitting. These will be interspersed with emo posts from hopeless lovers pouring their guts out and mixing them with molasses. There will be a mass exodus to Cebu where the naturally fun loving Filipinos prefer to be incarcerated. My blogger pal RR says that's where she'd like to go to become part of the Cebu Dancing Inmates, who at least are allowed some form of fun in jail. What makes everything doubly sad is that some of our senators apparently signed the bill without reading the revised version in full. Here's hoping they move quickly to amend. In the meantime, let's all pray they have special jail cells for bloggers, posters, likers and tweeters. The libel clause is too ridiculous indeed. It's so vague it's dangerous and to a point, stupid. I like how you put it, how a joke can be cause of a criminal charge. Context isn't even considered! I'm glad we're taking a stand and urging the lawmakers to amend. Hopefully, this law or the contents of this law can be reviewed and edited by our law makers. Some of it are really unconstitutional. This law needs a good revision. Maybe they should also look over the antiquated Libel Law that we have which is obviously the basis for interpreting e-Libel as well. But I have to say that we need a cybercrime law especially to protect ourselves from identity theft and even cyberbullying. Again, another law passed without consulting the "boss." Some provisions of this law are really unfair and unlawful, considering that some did experience bashing because of a thing that he/she REALLY has done. Parang ganti. What does that mean? They don't want criticism? Ayaw nila ng constructive criticism from their "boss?" Oh my!!! I think there are several loopholes on this law. It needs to be reviewed and amended for everybody to see the POSITIVE side of this so controversial issue. hahaha... when you vote for a law, you read everything and understand it... piece by piece. this law is so vague and general, thus loopholes is inevitable. Yahweh bless. Thanks for sharing this. I still have to equip myself more about this new law so I can weigh it myself properly. Everything's not perfect and has its own flaws just like this newly enacted cybercrime law. Hopefully, soon our legislators will get to see the light and make ammendments. There will certainly be lots of scenarios from the not so flawless Cybercrime Law. Hoping that lawmakers study this further and make proper amendments. I believe CyberCrime Law is a very interesting and challenging law. Let's see how the Supreme Court will uphold the rights of the people. Stupid law from our already stupid lawmakers. Ooops! Will I get jailed for this? Haha. Not to worry, the Supreme Court has already issued a temporary restraining order (TRO) on the bill as of today. Now, let's expect the best. 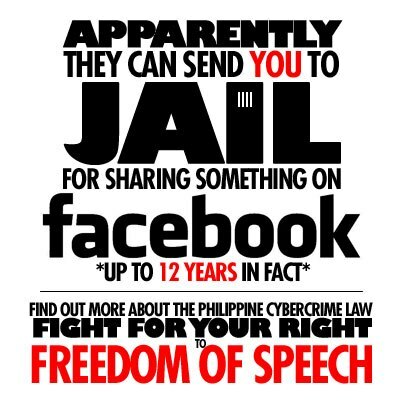 I'm really hoping the contents of this Cybercrime Law can be reviewed and properly revised by our law makers. Some of it are really unconstitutional and terribly ridiculous! alam ko pinag-aaralan na ito ulet! I heard this on news here in the United States. Thanks for sharing this post dear.